The village of Chaumont-sur-Loire is on the banks of the Loire river about 17 kilometres to the south-west of Blois. 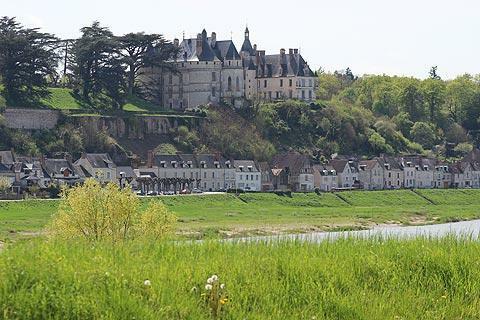 The village itself, although pleasant, would perhaps go unnoticed by visitors as they travel through this picturesque part of the Loire Valley, if it was not home to one of the most impressive castles in the region, the Chateau de Chaumont-sur-Loire. Note: if you are using a GPS to get here be sure to select 'Chaumont-sur-Loire' - there are lots of places called Chaumont in France! 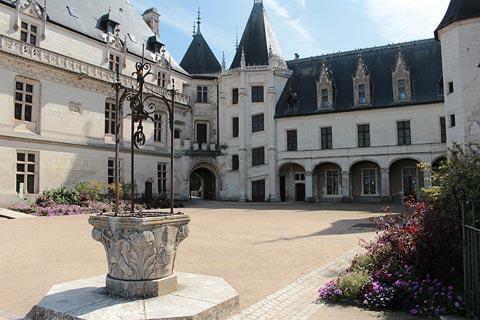 Note that the parking for the castle, and the main castle entrance, are several hundred metres from the centre of the village at the top of a long hill, so while it is possible to walk to the castle from Chaumont-sur-Loire village you are likely to prefer to drive, especially on a hot day. The parking is not well signposted, but there is only one road that goes up the hill from the centre of the village so you can't go far wrong! The castle in Chaumont-sur-Loire stands on a raised hill just behind the village, from where it towers over the houses along the riverside. 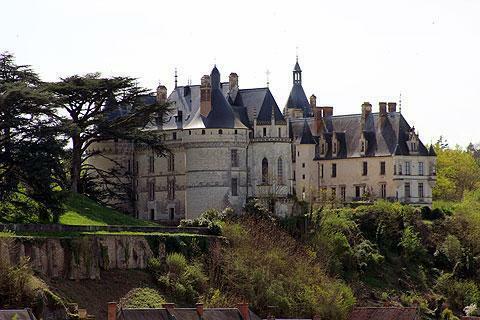 As with many castles in the Loire Valley, the chateau was built in the 15th-16th centuries on the site of a much older castle. The original 11th century castle was destroyed by King Louis XI because the owner had been part of a movement against the growing royal power. A few years later he regained the favours of the King and was given permission to rebuild the castle. 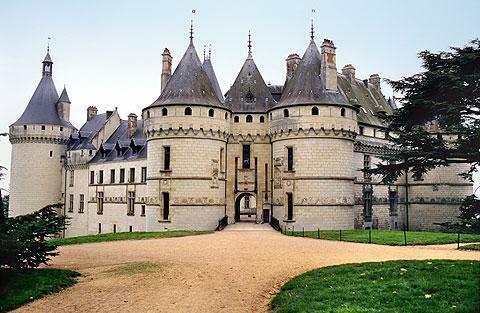 In the middle of the 16th century the castle belonged to Catherine de Medici from 1550 - 1560 until she 'persuaded' Diane de Poitiers to exchange it for the Chateau de Chenonceau! 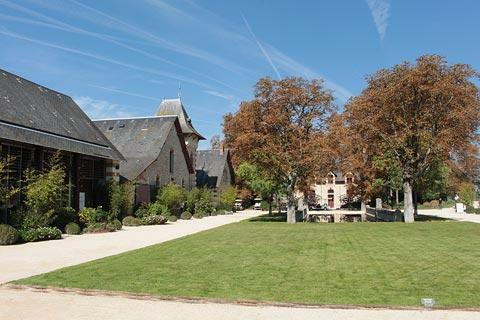 Before you reach the main castle entrance you pass a group of oubuildings that are established around a pretty courtyard area and include various gardens and works of art, as well as a small cafe. 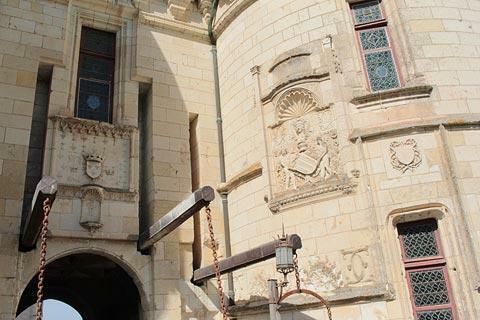 The main body of the castle combines two distinctive style: defensive elements in the gothic style, and decorative elements in the renaissance style. It is an imposing building with round towers in each corner, and is entered across a drawbridge between two more towers, each featuring a panel of decorative stonework. 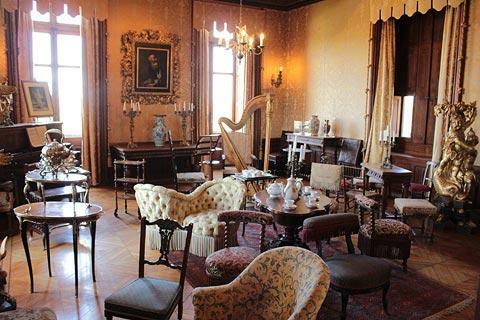 There is a great deal to see and enjoy within Chaumont Castle, with the rooms carefully restored and furnished. 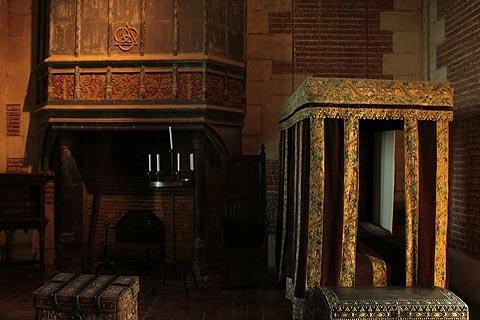 First you pass through the historic apartments such as the Chamber of Catherine de Médici and the Chamber of Diane de Poitiers which are furnished in the 16th century style, then through the private apartments such as the dining room and the main salon that are decorated in a more recent style. 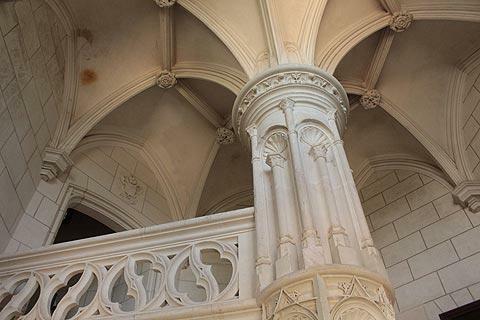 The grand spiral staircase in the centre of the castle is among the highlights. 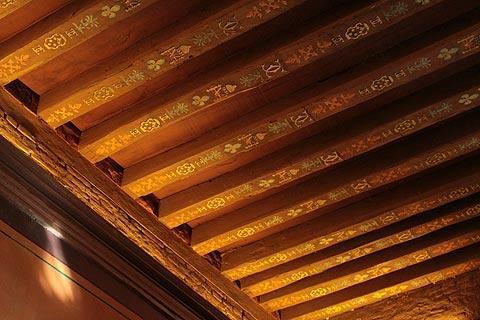 One of the most unusual highlights is the floor in the salon, which is a made from a large panel of painted ceramic tiles, and the library with its great tapestry was another of our favourite rooms.Altogether there are about 15 rooms to see, and a small gothic style chapel. 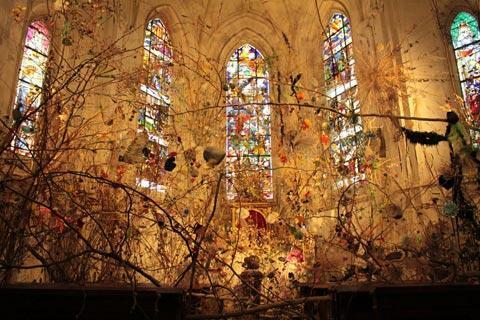 Several of the rooms also incorporate contemporary works of art. As well as the principal building you can also see the stables, the original farm and various other buildings. 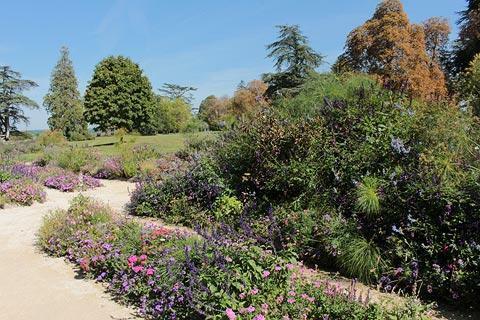 The gardens of Chaumont-sur-Loire castle are officially listed as a French 'remarkable garden'. Less formal than those found at many of the Loire castles, you can stroll through the wooded parkland as well as seeing the kitchen garden. 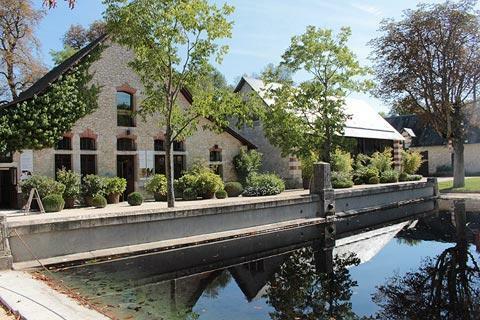 There is also a garden collection here called the Park du Goualoup where permanent gardens with modern and contemporary designs have been established. 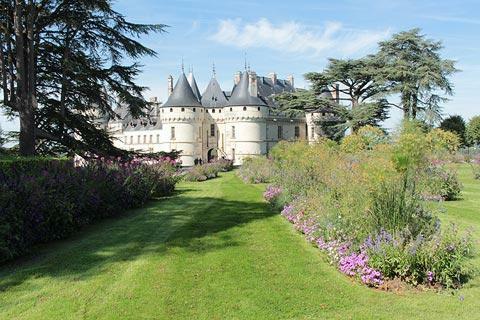 Chaumont-sur-Loire castle is also well known for the annual 'Festival International des Jardins de Chaumont-sur-Loire' (International Festival of Gardens), held here from May to early October for each of the last 20 years. Both the castle and the festival gardens are part of the 'Domaine de Chaumont-sur-Loire', which is now a government owned property. Each year there is a different theme to the gardens such as water, colour, sensations, capital sins and about 25 different well known gardeners from around the world create their own individual masterpieces here. 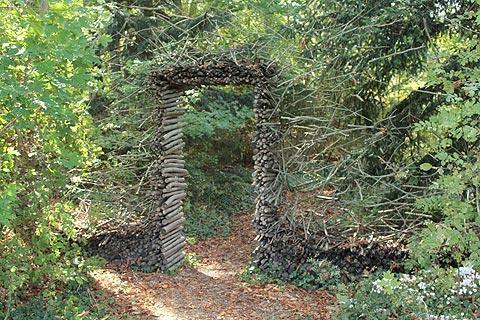 Certainly not to be missed if you visit during the summer, the festival attracts about 350,000 visitors each year, every year's gardens are different and there is always something new and inspiring to discover. Entrance is around 11 euros to enter the castle, 12 euros for the Garden Festival, or 16 euros for a combined ticket to enter both attractions. You can explore the castle and grounds at your own speed, or if you prefer guided tours are also available at no extra cost. 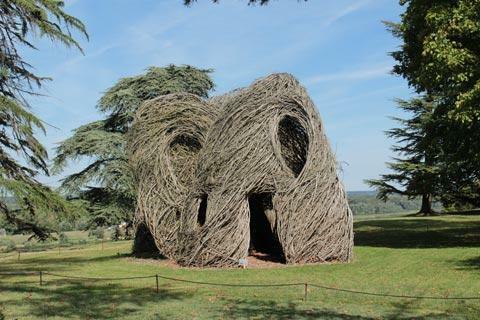 To visit both you will need to allow at least two hours - while the castle itself is not particularly large, the garden festival is quite extensive and the historic park and Park de Goualoup are also substantial - and it would be easy for garden enthusiasts to spend most of a day here. The castle is open every day of the year except for New Years Day and Christmas Day although the restaurants are closed in the winter months. 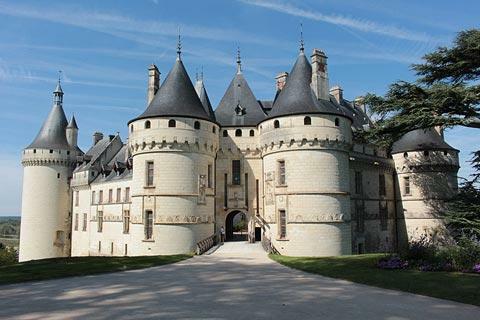 Before visiting the main highlights we suggest you cross the bridge across the Loire in the village and drive a short distance to the right at the roundabout at the far end of the bridge for one of the best views of the castle and Chaumont-sur-Loire village. During the summer you can take a boat ride along the Loire river in the village in a traditional river sailboat. Chaumont-sur-Loire is positioned between Blois and Amboise, two of the most interesting destinations in the Loire Valley. Both of these towns also have castles - the Chateau d'Amboise is one of our favourites in the region - as well as impressive historic centres.